As a head ghillie on the River Tay I lived & worked through the era where 'world record' distance casts were driving the entire industry. Don't get me wrong here as some of these Scottish salmon men are all legends in the their own right and truly great ambassadors for the sport then & also now. Their amazing abilities with a 100ft headed Speyline & 18ft competition rod truly needed to be seen to be believed. With every game fair fight for added distance a new product would hit the shelves and the tackle dealers were selling many of these distance Spey lines like hot cakes. I recall an angler turning up on my beat and handing me a boxed brand new Speyline & his existing fly reel for fitting. Even after taking the backing off the reel the new 100ft headed Speyline wouldn't fit so I had to lend him one of my reels to try his new line out. He could get a line out only if he worked with half of the head! At 60 or 70 yards the only thing you're in control of is the terror and fear you're inflicting upon the wildlife on the other side of the river so forget the distance crap that's hindered this business. The angling community at large couldn't 'cast a shadow' when it came to these monster lines and in came the easier to use shooting head concept. These horrible little Scandinavian things are the furthest thing away from arial elegance you could ever imagine in a salmon fly line yet they could be effortlessly delivered at distance my most anglers so they quickly caught on. The theme was developed into these 'washing line' Skagit monstrosities that you see today. One of my ghillie friends refers to these new breed fly lines as 'talent compensators' which just about sums them up perfectly. The problem with both of the above is at what point does the angler realise that from a salmon's point of view it's only the fly that matters and how it's swimming & waggling in and across the stream. An unmendable distance cast with a shooting head (if your running line management is good enough) or a huge Speycast at 70 yards puts your fly in no man's land as far as control goes until it's back within 40 yards of your own riverbank. If you need distance like that it would be far more sensible to have the ghillie take you over in the boat to the far bank where you can fish a short controlled fly. The reality of Scottish salmon fly fishing is that most salmon will take a fly at between 10 & 20 yards from your side of the river where the fly is swimming optimally. 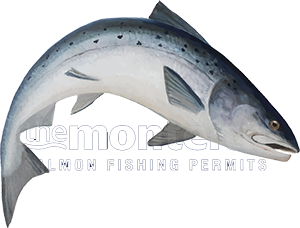 Save your energy and the need to impress other salmon fishers as the only thing you need to impress is that big silver beast who's looking for something to attack from its lie at the bottom of the river. Get your thoughts sub surface as quickly as you can if you want success in this game. Look for the fisher who throws 3 flies away after testing them on a piece of nylon before tying 'one' on to his leader that's passed the movement test. Look for the fisher who's come through a pool that 2 or 3 others have fished before him yet still hooks and lands the only 2 salmon of the day. That man will sometimes be an angler but more often than not he will be a 'professional' ghillie. Talent spotting on the rivers of Scotland is easy as social media & fishing hut chat will give you a few clues but if you want to learn how to be a true 'sub surface' salmon fishing technician and have your catch results soar then you need to find a mentor who's got the correct approach and forget the distance casting theme. It's often only a split second decision for a salmon to be impressed enough to take a controlled evenly spaced salmon fly as it glides and waggles its way down through a pool. The only thoughts you should be focussed on are your fly's depth, speed and most importantly of all its natural movement.